Our grass clippings are too valuable to waste! When left on the lawn, properly mowed grass clippings filter down to the soil and decompose rapidly,usually within a few weeks. During the breakdown process, the clippings feed soil organisms, recycle plant nutrients, and contribute organic matter to the soil. These are all great things for our lawns. Research tells us that grass clippings contain about 4 percent nitrogen(N), 0.5 percent phosphorus (P), 2 percent potassium (K), plus small amounts of other plant nutrients. As much as 50 percent of the N that you apply as fertilizer is removed when grass clippings are collected. Studies at the University of Missouri show that grass clippings can supply 25 percent of a lawn's total fertilizer needs. The University of Connecticut found that the N from grass clippings began showing up in the growing grass within 2 weeks. During the summer months, grass clippings can account for nearly half the weight of the waste collected in some communities! Curbside collection of grass clippings increases trash, handling, and hauling costs, while burying grass clippings reduces available landfill space. Mow your grass 2 inches tall and mow frequently enough that you only remove one third of the height of the grass. Using this practice of mowing when the grass reaches 3 inches will allow you to recycle your grass clippings by simply leaving them on the lawn. 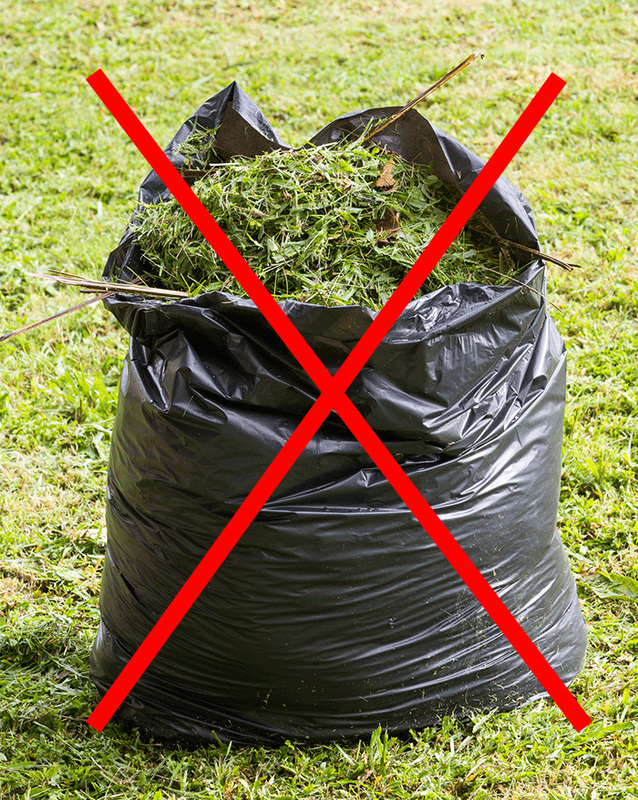 If you must remove the grass clippings, there are other good methods to recycling grass clippings, including using them as a mulch or soil additive in gardens, or as an ingredient in a compost pile. However, do not use grass that has been treated with weed killers as a mulch or incorporate it into garden soil as these could harm your desirable plants. Leave herbicide-treated clippings on the lawn or compost them, and be sure to check the herbicide label for additional precautions. Grass clippings can serve as a garden mulch to discourage weeds, retain soil moisture, and reduce erosion. The grass eventually decomposes, adding organic matter and plant nutrients to the soil. I use my grass clippings to mulch my vegetable garden. Add the grass clipping mulch in one inch layers, then allowing the layer to dry thoroughly before adding an additional inch of grass mulch. Green grass clippings are an excellent source of "green" material for your backyard composting. Do not add more than half the volume of the compost pile in new fresh green grass clippings. Wait 24 hours then turn your compost to incorporate and aerate your compost. Let us all - recycle and reuse our grass clippings. It is good for our lawns and garden while saving valuable landfill space.